One of the many things that boggles my mind is that as food bloggers become more proficient in their cooking skills–and technology get better, faster, and easier–the images of their dishes become shockingly good. I mean, perversely good. Take a look at smittenkitchen.com, 101 Cookbooks, or Cupcake Bakeshop. Some of those pictures are cookbook-worthy. And after having been in advertising for years, as well as being on set for the shoot for my own cookbook, I know the amount of work (and the tricks) that go into shooting the perfect image. For every cookie in a shot, a dozen are baked. For every pound of braised beef ribs nestled in a pot on the cover of a magazine, four pounds are cooked. 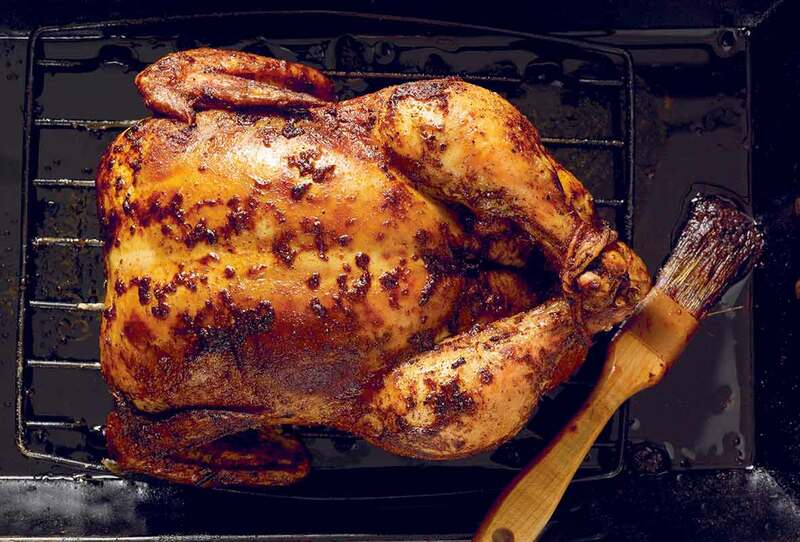 Then the food stylist picks through pan, pot, or baking sheet finding that one specimen the camera will love. But my guess is most bloggers aren’t making four, five, or, God forbid, six times the amount require in a recipe for one fleeting shot on their blogs. I think it’s a do-or-die, one-photo-has-to-make it phenom. A fact that left me banging my head against my kitchen cabinets today when I pulled out my latest loaf of bread, only to discover the pathetic, glutenous mess awaiting me in the pot. I could have left my camera in my bag, telling no one, but I decided to buck up, face the music, and photograph my miserable failure for all the world to see. No toasty loaf here. No tender, open crumb and crackly crust. No image that will make the round of the Internet or be a universal fave on Flickr. It’s just a one-inch-high cow flap that bears not even a passing resemblance to its forbearer. View it and snicker, dear reader, while I weep. You might recall I’m going full throttle with the New York Times’ No-Knead Bread. After having incredible success on my first try, I’ve been revisiting the recipe weekly, with diminishing return. (If I keep this up, by next week, I’ll pull matzoh out of the pot.) I tried to figure out what went wrong, but I’ve come up empty-handed. The loaf was baked in the same oven, in the same pot, using the same flour and yeast as the prior glorious loaf. I think the problem is I’ve lost my baking mojo. In keeping with our “Month of Comfort” theme over on the homepage (yes, I actually cook from our site), I destroyed Ina Garten’s idiot-proof Lemon Cake (it rose beautifully, then collapsed, leaving behind a sink hole the size of my fist) and drastically over baked a delicate shortbread so its pale complexion was more the color of a Hollywood spray-on tan. My only success in the past seven days: Diane Morgan’s Garlic and Herb-Rubbed Crown Roast of Pork. But I’m a baker at heart. I get off on the precision of measurements, the exactness of temperatures, the mental fretwork that goes into creating the perfect piece of sweet goodness. So the fact that I was able to pull off a succulent roast with nary a thought of reaching for a Xanex says less about Diane’s excellent recipe and more about some “Freaky Friday” catastrophe, where my normally preternatural adeptness at the art of baking and my quivering reaction when I have to face the stove with a piece of raw meat in my hands changed places. I can only hope this curse, this godforsaken run of baker’s bad luck ends soon. I have cookies to make and cakes to frost. My friends are starting to give me that perplexed, IQ-of-a-philodendron look Jeff Bridges gives Karen Allen in “Starman,” and it’s making me uncomfortable. Lost your baking mojo? Oh, can I relate. I learned to bake starting when I was 4 or 5 years old, at my grandmother’s knee, or up on a chair so I could reach the counter. 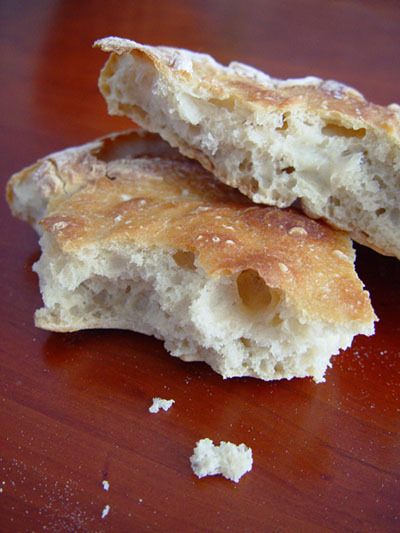 I baked bread for many years without a recipe, pizzas at least once a week–no recipe. Then, one day, I couldn’t make anything I was willing to own. I imagine you’ve gotten your mojo back by now. I’ve been craving the baking thrill a lot lately, and one of these days I’m going to give my old mojo another try. That bread in the picture on the right? Until after the jump, when I learned it was the bad bread, I thought it looked great. I bet it would have tasted great warm with plenty of butter. ;) It reminds me a bit of something the House of Bagels in SF calls “flats.” Heh. They are bagel dough rolled out and cooked flat, and they make them with onions and poppy seeds (IIRC) on top. We lived within walking distance for a while, and trekked over there early every Saturday to get our flat fix. So, don’t denigrate it without tasting it. And maybe top it with some onions and poppy seeds, just in case. And yes, the “bad” bread is the image at the top and to the right. It tasted okay, but for the life of me I have no idea how it got that way. Well, when you want disaster advice, just give me a jingle. Thoroughly enjoyed this article. I am feeling the same way. I have been baking bread for the last three years. 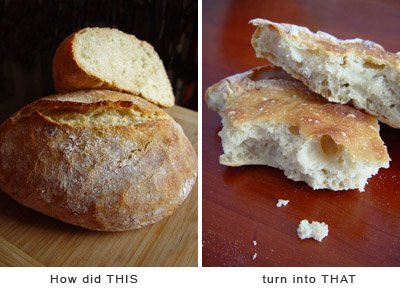 I first made your Ciabatta Bread 2 years ago. A raving success. Looked just like your photo and delicious. I have made 2 attempts in the last week to make it again. An utter disappointment both times. Flat as a pancake. Exterior dull, but crusty. As for the crumb, no holes, dense an unappealing. The Bread Gods are definitely punishing me for some unknown crime. Barbara, I hear you. I’m beginning to think there is some global conspiracy crisis going on, as several people have written us within the past week about different bread recipes on the site. They, too, found that their loaves were as flat as pancakes. And these are tried and true recipes! We must find a way to appease the hungry Bread Gods! Hang in there, Barbara, your baking mojo will return.